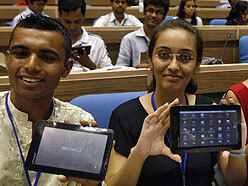 Earlier this year Askwiki had share how global investors are keen to fund this project of $35 tablet. Earlier this week the Telecom and Human Resource Development minister Kapil Sibal recently launched the tablet - Aakash - priced at $35. The original prototype named Sakshat was unveiled in 2009. About 500 students from government engineering schools were at the launch and were among the first to get their very own Aakash devices. The Aakash is designed and built by UK firm Datawind, Below is an interview with its Chief Executive Suneet Singh Tuli. The manufacturer Datawind has also announced that it will start selling the commercial version of Aakash (named as Ubislate 7) in November. The price for commercial will be INR 2,999. This retail version will be available via normal stores, and online stores, but the exact availability details are still not out.